New! 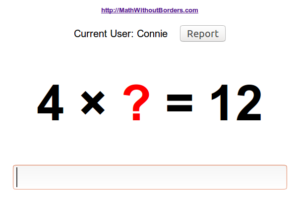 Free multiplication tables practice online New! Click image (or title) to start the program. Learning the multiplication and division combinations has the same relation to mathematics as doing push-ups has to playing a sport. This isn’t “real mathematics” but it is a necessary skill, and if you get good at it, the rest of mathematics becomes easier. This program can help you achieve mastery painlessly, let you know how you’re doing along the way, and let you know when you get there. “Learn ’em Forwards and Backwards” is based on a variation of the Leitner System that teaches all of the multiplication and division combinations efficiently and allows you to see your progress graphically as you go along. I wrote the original version of this program while working with a remedial class of middle school and high school students who had experienced repeated failures in trying to learn their basic multiplication combinations over several years. They entered the class very discouraged, thinking they were simply not good at math. The program was very popular with them (almost addictive) and they made rapid progress, most of them achieving mastery after several weeks. This program measures response time on each individual problem and adjusts how many days before asking the same problem again, based on how consistently and how quickly the user is able to give the correct answer. Commit to doing a short (10 or 15 minute) session every day until you achieve mastery and you will know the basic multiplication combinations, forwards and backwards, for life! The program runs right in the web page. There is nothing to download or install. Just bookmark the site. Set a time limit for the session that does not seem burdensome: something between 10 and 15 minutes is probably enough for one sitting. (There is also an option for an open-ended session.) See how you feel and how many problems you can finish in the time you selected. The program will keep track and take up in the next session where you left off. You don’t need to do all the problems at once. Make sure the keyboard cursor (vertical line) is in the input box. It should be there automatically, but if not, click inside the box to put it there. If you get the problem right, the computer will display the problem with the answer in blue in place of the question mark. Type <Enter> to continue. If you miss a problem, the computer will restate it with the answer in red in place of the question mark. You will have to retype the correct answer before you can proceed. This forces you to stop and focus on the right answer. Once you have given the right answer and you see it in blue, type <Enter> to continue to the next problem. The mastery level ranges from 0 (untried), to 5 (mastery). Advancement depends on getting the correct answer quickly and consistently. This activity is designed to be done every day. As your proficiency grows, the interval between repetitions of the same problem becomes greater. –Mastery level 0: The problem has not yet been presented. –Mastery level 1: You either missed the problem or took too long to answer it. The problem may be asked again on the same day. –Mastery level 2: You answered the problem correctly, but you had to think about it awhile. The problem won’t be presented again until the next day. –Mastery level 3: You answered quickly, without having to think too long. (It is possible to go directly from level 0 to 3 if you already know the answer well.) You won’t see the same problem again for at least 2 days. –Mastery level 4: You have previously achieved level 3 and have again answered correctly and quickly. You won’t see this problem again for 4 days. –Mastery Level 5: You have previously achieved mastery level 4 and continue to answer correctly and quickly. The goal is to reach level 5 for all problems. When you reach level 5 you won’t see the same problem again for 8 days. It moves the learning to long-term memory, making the memory permanent. As your mastery level increases for more and more problems, there may be fewer problems available in a session. This is normal. Take it as a reward! Continue every day until you achieve complete mastery … 5‘s across the board. The sequence taught here has a couple of added enhancements. In addition to the multiplication tables up to 12 x 12, it covers four additional combinations: the perfect squares up to 16 x 16. Also, division by zero is covered in “missing factor” form: 0 x ? = 1″ is “undefined.” There is no solution, so the expected answer is “N”. 0 x ? = 0, is also undefined, but in this case any answer will work, so the expected answer is “A”. These exceptions are not usually covered at this level, but this seems like as good a time as any.